Also serving communities of Medford. There are 51 Assisted Living Facilities in the Somerville area, with 2 in Somerville and 49 nearby. To help you with your search, browse the 242 reviews below for assisted living facilities in Somerville. On average, consumers rate assisted living in Somerville 4.4 out of 5 stars. Better rated regions include Cambridge with an average rating of 4.4 out of 5 stars. Caring.com has helped thousands of families find high-quality senior care. To speak with one of our Family Advisors about assisted living options and costs in Somerville, call (855) 863-8283. Somerville, Mass., the recipient of the All-America City Award in 2015 is one of the most ethnically diverse cities in the nation and one of the most densely populated cities in New England. Located two miles north of Boston, seniors, who make up 10 percent of the population in Somerville, have much to explore. This includes two assisted living residences in Somerville, with another 55 nearby in surrounding communities including Brighton, Chestnut Hill, Newton and Watertown. Each of these facilities provides aging adults with personal care services and assistance with the activities of daily living, such as grooming, bathing and medication management, all within a secure and comfortable residential setting. Somerville's weather is hot during the summer, though the southern part of the community, which is near Boston's Back Bay, may enjoy cooler ocean breezes. Winters are cold with occasional heavy snow and rain, and fog is common at all times of the year. The greater Somerville and Boston area is home to world-class medical facilities, including Massachusetts General Hospital, Brigham and Women's Hospital and Beth Israel Deaconess Medical Center, in the event of medical emergencies or illness. While Somerville's cost of living is 78.70 percent higher than the national average, it's lower than the cost of living in neighboring communities such as Cambridge or Boston itself, making it an affordable location for those that want to stay in the area. Somerville has an array of community resources for seniors, including Citizens Energy Corporation, an organization that provides financial assistance to older adults who can't pay their heating bills, as well as three senior centers. Somerville residents enjoy easy access to the arts and culture of Boston, which include a wealth of museums, live theater and concerts from the Boston Symphony Orchestra and Boston Pops, among others. Closer to home, the Somerville Arts Council supports local artists exploring puppetry, street art and other pursuits. The state of Massachusetts is a member of the AARP Network of Age-Friendly Communities, meaning that its elected leadership “has made the commitment to actively work toward making their town, city or county a great place for people of all ages,” according to AARP. Assisted Living costs in Somerville start around $0 per month on average, while the nationwide average cost of assisted living is $4,000 per month, according to the latest figures from Genworth’s Cost of Care Survey. It’s important to note that assisted living rates in Somerville and the surrounding suburbs can vary widely based on factors such as location, the level of care needed, apartment size and the types of amenities offered at each community. 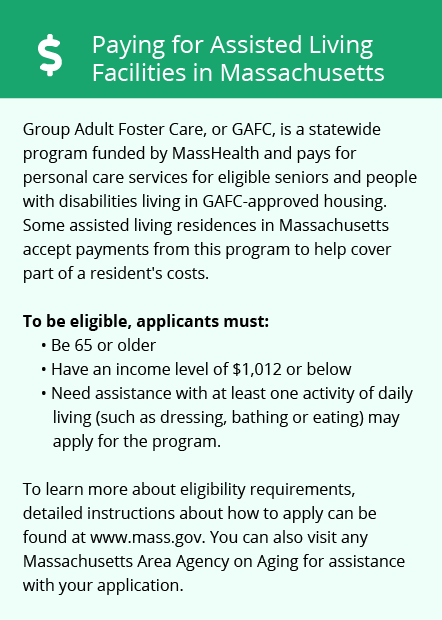 Two government programs — Group Adult Foster Care and Supplemental Security Income Category G — may be available to help eligible seniors in Somerville pay for assisted living. Somerville and the surrounding area are home to numerous government agencies and non-profit organizations offering help for seniors searching for or currently residing in an assisted living community. These organizations can also provide assistance in a number of other eldercare services such as geriatric care management, elder law advice, estate planning, finding home care and health and wellness programs. To see a list of free assisted living resources in Somerville, please visit our Assisted Living in Massachusetts page. Somerville-area assisted living communities must adhere to the comprehensive set of state laws and regulations that all assisted living communities in Massachusetts are required to follow. 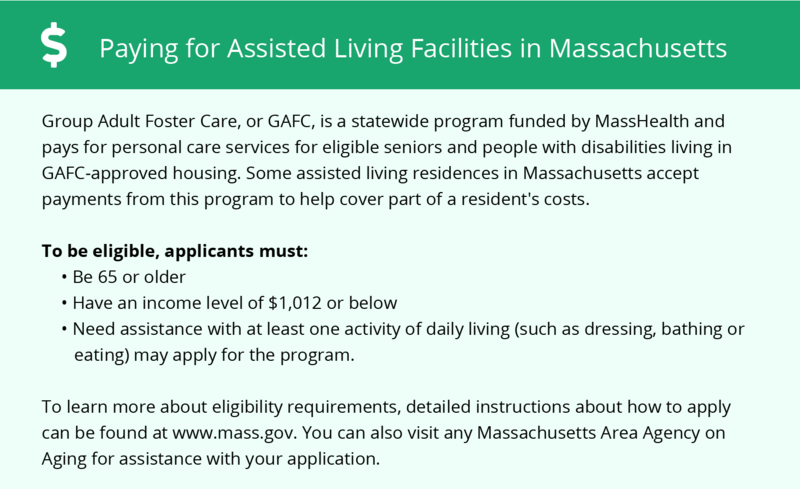 Visit our Assisted Living in Massachusetts page for more information about these laws.